Water for health, yes; but water therapy is not common knowledge. 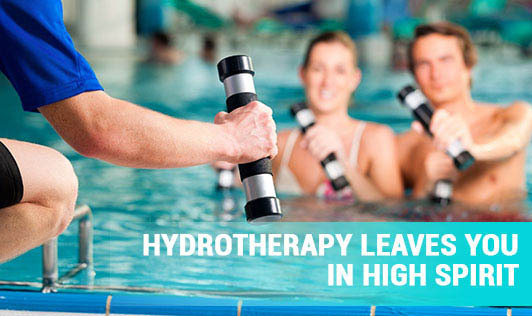 "A number of ailments can be cured or controlled with water therapy or hydrotherapy. This form of treatment is a part of naturopathy though modern medicine does not promote it. Water forms a major part of the earth and our body. About 60% of our body is water. No living being can survive without it. Water is essential to absorb the food, to maintain the body temperature, to flush out the waste from our body, to maintain the moisture balance and to prevent problems like constipation, premature skin wrinkling and urinary tract infections. We lose water from the body everyday through our lungs, skin, kidneys and digestive tract when we breathe, sweat, pass urine and move bowels. To replace the lost water, we need to drink at least two litres of water daily. During exercise and hot weather, the body asks for more water. According to Dr Brahmacharya, water is best at room temperature. Children or the elderly may take tepid water. Beverages like coffee, tea, soft drinks and alcohol cannot act as substitutes for water. The chemicals present in them act as mild diuretics and remove water from the body, leaving the body craving for more water. Drinking lots of water reduces craving for stimulants like caffeine, alcohol, and smoking. Drink a few sips of water before your meals and a few sips after your meals. Leave an hour's gap after your meals to drink water in larger quantities. This promotes digestion. One thinks of bathing only to cleanse the skin. Bathing can activate the blood circulation on the body surface when cold water is used. A cold water bath works best, but if that isn't possible end your bath with a cold water rinse to close all the pores which open up when hot water is used. He also advises rubbing the body with a cloth after a bath to remove the dead cells. He says that using cold water on the scalp daily stimulates the circulation and helps to prevent hair loss, reduces stress and migraine headaches. A steam bath opens the pores on the skin, speeds up blood circulation, helps to remove toxins through sweat and reduces congestion in the lungs. Steam bath should be followed by a cold shower and a glass of water to drink. Steam bath is advisable only once a week. Also, soaking your feet in warm water relieves exhaustion and stress-induced headaches. To relieve fatigue, sip (not gulp) a glass of water. This brings down the body temperature and re-moves exhaustion. Cold water packs help to regulate blood pressure (please do it with proper guidance). Damage caused by meningitis can be prevented by cold packs on the head/ forehead. Cold bandage applied for 15-20 minutes on painful body surface will get help get rid of the pain. This happens because the cold bandage relaxes the muscles and improves blood circulation to the area. Stimulation packs are used for conditions like constipation diabetes and asthma, a stimulation pack consists of a thin cotton cloth dipped in cold water and wrapped around the affected area - organ and covered by a woolen cloth. The woolen cloth maintains the temperature of the cotton cloth. This stimulates the weakened cells of the pancreas in diabetics' and releases congestion in case of asthmatics. A hip bath for 20 minutes tones up the intestines and a spinal bath soothes the nervous system. Both these are to be done on a light or empty stomach. A warm water enema (bhasti) removes the toxic wastes without using purgatives. For cracked feet, a dip in warm water for a few minutes followed by a massage with a cloth will help.